Black Bean and Corn Topped Potatoes | Mommy, I'm Hungy!! 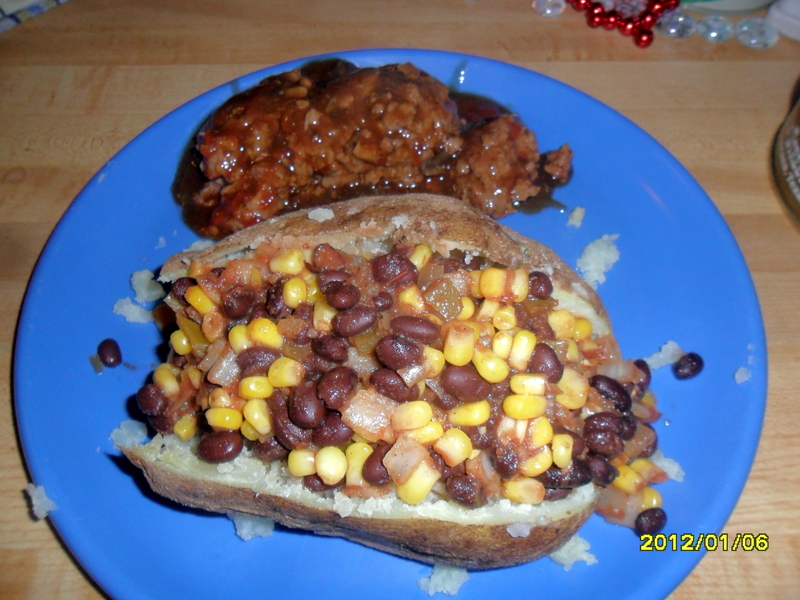 These Black Bean and Corn Topped Baked Potatoes were really good, but I wish I had picked out some smaller potatoes. I fixed them alongside some little smothered Salisbury Steaks and it was so good! The potatoes could have been a meal in itself so next time I will get smaller potatoes. Anyway, they were really delicious and I hope you get a chance to try them soon!! Pierce potatoes with a fork; arrange in a circle on paper towels in microwave oven. Microwave at HIGH 10 minutes, turning and rearranging potatoes after 5 minutes. While potatoes cook, heat a large nonstick skillet over medium-high heat. Coat pan with cooking spray. Add onion and next 3 ingredients; sauté 3 minutes. Reduce heat to low. Add beans, corn, and salsa; cook 4 minutes or until thoroughly heated. Split potatoes lengthwise, cutting to, but not through, other side. Fluff with a fork. Spoon about 1 cup bean mixture over each potato. Top each serving evenly with cheese and cilantro. This is what you get when you are all done…delicious!! These were really good and I will definitely be making these again! !